After enjoying your roast beef with Yorkshire pudding and a side salad, how about a dessert using custard sauce? The ingredient here that caught my eye was ‘Spry’. 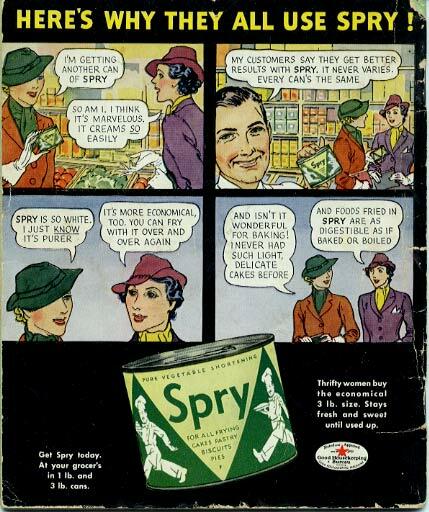 Quick internet research revealed that Spry was an American brand of vegetable shortening introduced by Lever Brothers around the 1940s (although I have found Spry pictured in ‘The 1930s Scrapbook’) and is no longer produced. Its closest competitor was Crisco, which we can still buy today. My grandmother taught me that the secret to successful shortcrust pastry was to use half butter and half Crisco. Have a look at grandma’s Crisco Pastry recipe (including more notes on Crisco history). What was a new innovation in food technology in grandmother’s time is however very much out of fashion these days because of new scientific knowledge. Crisco, being a type of hydrogenated vegetable oil with four grams of trans fats per tablespoon, was in trouble when information about the health risks of trans fats emerged. As a result, in January 2007, Crisco was reformulated to contain ‘zero trans fats per serving’ (read the press release). Do note that zero grams ‘per serving’ doesn’t mean no trans fats whatsoever; as this Associated Press news report reminds us, “U.S. Food and Drug Administration allows any product with less than 0.5 grams trans fat per serving to list zero grams trans fat”. These wonderful pictures (front & back) of a cookbook put out by Spry really give a flavour of those times – ‘thrifty and healthful’. Well, it was also the era when Capstan cigarettes were advertised with pictures of athletic swimmers :). uncapitalized making me think that’s how it was on the label and in common usage. Compare to Crisco which is capitalized. Is there a way to date it’s appearance and disappearance from the markets? 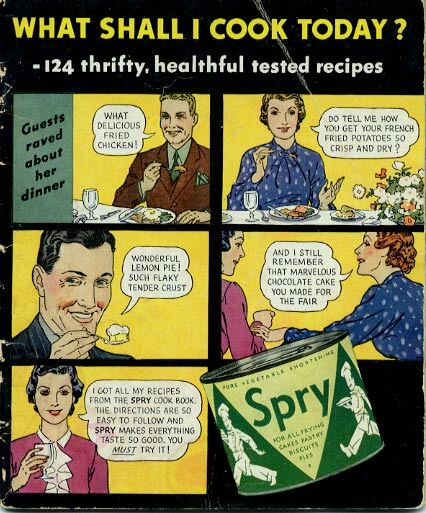 Spry could have become a generic name for this kind of vegetable shortening, in the same way that ‘biro’ and ‘xerox’ have passed from being capitalised brand names to generic names for ballpoint pens and photocopying. I believe Spry was British and Crisco, American, so a person’s relative degree of familiarity with the product could depend on the location. A good way to start finding out more is simply to talk to people who lived through the ‘Spry generation’ and see what they remember about when it was popular and when it disappeared. I just had a conversation like this a few days ago with a British man who remembers Spry and its competitor, Trex, as well as Crisco very well, and an American lady who said everyone in her mother’s generation cooked with Crisco. I have an Armenian cookbook from 1949 that calls for “spry”, too. Wasn’t surprised that it was a form of shortening, but wonder if Crisco would be close enough to use instead. If not, is there something better? Wow! An Armenian cookbook from 1949!! I have not had any personal experience of Spry but from all descriptions I’ve read so far, Crisco sounds extremely similar. Would be very interested to hear your results if you experiment :)! Thanks and good luck! It belonged to my parents and I inherited it :) Trying to find some of the ingredients is sometimes a challenge. I’ll probably give this one a try this week. Will let you know how the Crisco measures up…that is, if I can remember how the lahmajoon tasted when I was a kid! I have a recipe from 1958 that calls for Spry. The recipe is for my great grandmother and great aunt’s Crunchy Meringue Spice Cake. I too was brought to this blog when I searched google for Spry. It’s a recipe I’ve been wanting to make but never knew what Spry was and my Grandmother passed away so I can’t ask her.